RBTH presents a selection of views from leading Russian media on international events, featuring news of the cancelation of U.S. Secretary of State John Kerry’s planned visit to Russia and reports on the Kremlin’s anti-crisis plan and adjustments to the 2015 budget, as well as the true scale of the Central Bank’s gold purchases in 2014. The business daily Kommersant writes that U.S. Secretary of State John Kerry is not planning to come to Moscow after all, according to the U.S. Embassy in Moscow. A newspaper source close to the Kremlin says that the meeting was called off on the initiative of the American side. 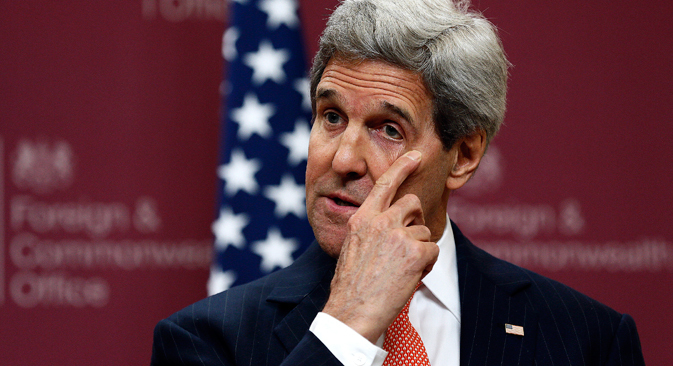 John Kerry had also asked to meet Russian President Vladimir Putin and the request was granted. However, the U.S. then canceled the visit. Earlier Kommersant learned that Kerry had planned to visit Moscow in order to meet with Russian Foreign Minister Sergei Lavrov. The visit had been planned to take place on Feb. 4-5, before the Munich Security Conference on Feb. 6-8. Had Kerry come to Moscow, it would have been his first visit to Russia since the beginning of the Ukrainian crisis. Meanwhile, business daily Vedomosti writes that on Jan. 30 Russian Vice Deputy Prime Minister Igor Shuvalov presented the government’s anti-crisis plan to the State Duma. "The difference between now and the 2008-2009 crisis is that back then everyone or almost everyone had it difficult, while now it is the Russian Federation that is going through hard times, and no one from outside will help us," the newspaper cites Shuvalov as saying. Briefly outlining the plan's priorities, Shuvalov explained that first of all there will be vast support for exports. Secondly, he emphasized that even given the current crisis, state budget expenditures on defense and agriculture will not be reduced. The government will also review its priorities on the labor market. "During the last crisis we did not learn how to deal with it and you criticized us for it," Shuvalov admitted. But now, he stressed, the government will help people, not businesses. In another article, Vedomosti reports that the Ministry of Economic Development has corrected its forecast for the annual average oil price in 2015. The Russian budget will be based on the annual average price of $50 a barrel, said Minister of Economic Development Alexei Ulyukayev. In December 2014 the ministry had already lowered the expected oil price to $80. Originally, the 2015 budget had been created based on an estimated price of $100 a barrel, notes Vedomosti. Ulyukayev believes that the $50 forecast is overly conservative: The consensus forecast is $10 higher. According to the minister, the current price level will remain for another quarter or two, after which the price will begin to rise and at the end of the year will be significantly higher than $50. Nevertheless, the ministry preferred a conservative approach, basing it on the "below the market" basic scenario forecast. Based on material from the Financial Times and a Thomson Reuters GFMS survey, the tabloid newspaper Moskovsky Komsomolets writes that while everyone has been following the bouncing exchange rates and the weakening of the ruble, the Russian Central Bank quietly set a record for gold purchases, buying up the yellow metal in volumes not seen since Soviet times. In 2014, Russia purchased almost one third of all the gold bought by central banks from various countries, writes Moskovsky Komsomolets. Russia thus spent more on gold than at any time since the collapse of the USSR. Experts say that the gold-buying spree demonstrates the Russian Central Bank's desire to reduce its dependence on the dollar and support the weakened ruble. The newspaper reminds its readers that during the 1998 crisis Russia had to sell 118 tons of gold in order to cover its financial deficits.